So how much water do these plants need? So I installed the gen 2 this weekend and I’m up and going. That was easy enough. But I’ve probably created and deleted a dozen or more schedules because I’m not sure what’s going on and my perception of what needs X amount of water is sorely lacking. The lawn looks fine but now I read that watering frequently is bad so I went with the flex daily. Cool. Now it waters longer but less frequently. 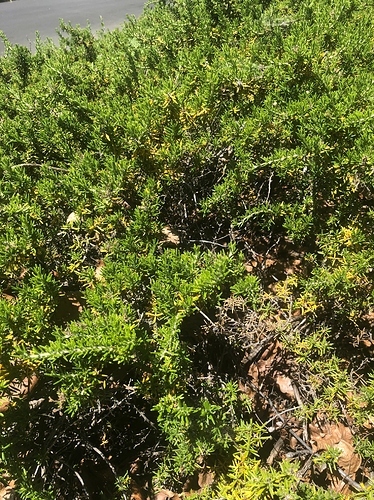 But I also have a front slope covered in what someone has told me is a type of juniper. It was set to water 25 minutes every two days. In looking into junipers this was really dumb. Looks like they are not water hogs so that was a waste. The flex daily wants to water them for two plus hours every 10 days or so. Is that right ?? I’m baffled by how the system decides how long to water based on such simple input when there are sooooooo many types of plants shrubs etc. This particular plant is used as a ground cover on a slope and covers maybe 50’ x 15’ and is apparently juniper types don’t need much of any water during summer. Fwiw. This is in the East Bay Area of California. No rain from May till November typically. Oh. Here’s that mystery plant ground cover. I see this question has been up here for awhile. I hope you can still benefit from the information. Different plants have different watering needs. The needs are satisfied by the type of irrigation, frequency and amount of time the system runs. Deep and less frequent irrigation is the key to better health of the plants. Your picture is of the Juniperus conferta. It needs very little water, once established. If you have that one on spray, then 7 minutes 2 times a week should be enough. Impact or other types of rotors would need @20 minutes 2 times a week. As soon as the 70 degree weather hits, you really don’t need any water since this plant can pull moisture from the air. Mature Junipers of 2 years or more can survive on watering every 2 to 3 weeks. I totally forgot I had posted this. Thanks for the reply! It turns out that these are Rosemary plants and apparently they are very drought resistant just like junipers. They managed to survive 2 months of oppressive heat with no watering. (some lost a lot of needles) Turns out someone broke off one of the sprayer heads with their car and that meant the other two sprayers didn’t water either due to lack of pressure. I had that fixed and watered the hell out of them for a few days and they seem to have bounced back. Fwiw I set this zone up as xeriscape and now it waters about 30 min every 7 days or so. It’s on flex daily so I assume it makes adjustments to the days and times. Rosemary works very well as xeriscape. It would even do good on half of a xeriscape schedule. I thought “deep watering” less often was better for plants. Not so for xeriscape? Xeriscapes are highly drought tolerant plants for the most part. When I deal with the term “Drought Tolerant”, I take it to the next levels. I can water any of these on the same schedule as another and even mix them on the same zone. I will only change the precipitation rate of the emitters from 1/4gph, 1/2 gph, 1gph or 1.5gph. They will all water deep and infrequently with the minimal amount of water per plant. You can even throw in citrus trees with one of these Xeriscape schedules once you understand how citrus trees work I will use twin 4gph emitters but they will only water once a week without leaf curl in the middle of 110 summer weather. Citrus trees have an amazing feature called Selective Transpiration. We know how all green foliage transpires CO2 and emits O2. Citrus trees only emit some of their O2 and pull in extra Hydrogen molecules in order to manufacture some of their own moisture for survival. With that in mind, your citrus do not need a whole lot of added water nor very often. I’m curious about the statement, “Citrus trees have an amazing feature called Selective Transpiration”. Are you talking about a specific citrus cultivar? Mesophyll conductance to CO2 in response to environmental factors? I wondered if you are referring to regulated deficit irrigation method? I am referring to the stomatic transpiration through the foliole extremeties.